The leader of the Houthis refuted the accusation and said on Saturday that Yemen is open to all parties playing a role in the country’s future. “Our hand is extended to every political force in this country ... the space is open for partnership, cooperation and brotherhood and now everybody bears their responsibility for building, not destruction,” Abdel Malik al-Houthi said in a televised speech. The Houthis say they have stepped into a power vacuum and they intend to replace the dissolved parliament with a 551-member national assembly. It would then elect a five-member presidential council, which would run the country for up to two years. But opposition parties in Yemen have so far declined to support the Houthis. 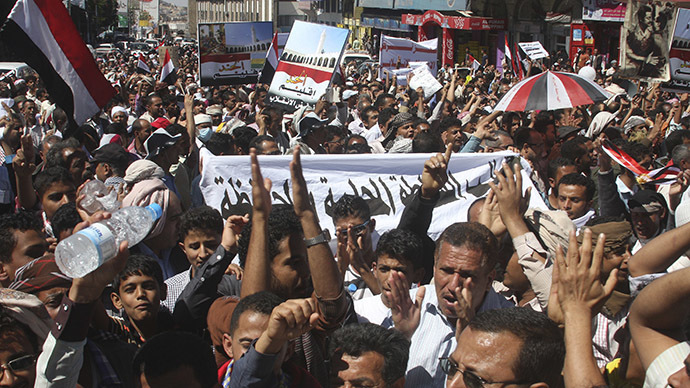 Thousands of people also protested in three cities in central Yemen against the seizing of power by the group. Both the prime minister and the president resigned last month after the Houthi rebels took over the presidential palace, leaving the turbulent country in political limbo. Ali Abdullah Saleh, the former ruling party of the ex-president, said in a statement that it regretted the Houthis’ moves. Several governors of Yemen’s restive regions in the south of the country also said in a joint statement that they rejected the takeover. The Islah Sunni Islamists, Yemen’s main opposition party, said the Houthi rebels had staged a coup and that they should be annulled. Tensions were high across Yemen on Saturday, with armed Houthis manning checkpoints. A bomb exploded in Sanaa at the home of the deposed prime minister, wounding three militiamen. No one has yet claimed responsibility but suspicion has fallen on Al-Qaeda in the Arabian Peninsula (AQAP) who have clashed repeatedly with the Shia group, raising the possibility of a sectarian civil war.